Here is an interesting fact for you: I attended the New School. Interested? Good! Allow me to develop this fascinating statement further: I attended the New School from 2002 through 2006, during which time it has seen several massive student and/or faculty protests due to one Bob Kerrey, who became its President in 2001. Also taking place since 2001: sympathetic profiles of Bob Kerrey in New York magazine, which invariably focus on how tough he has it at the New School and did you know that he has one leg? Yup. One leg and a lot of dead people on his conscience, that's our Bob. Yes, Bob Kerrey does, in fact, have one leg. This is only one of many fascinating facts about Bob Kerrey, and perhaps one of the least significant! Bob Kerrey also led an attack on a Vietnamese village, where he and his team killed civilians, including women and children, and Bob Kerrey has memories of these accounts that magically exonerate Bob Kerrey from the worst of the crimes and also (you won't believe this) do not line up with the memories of the other people who were there. Crazy! 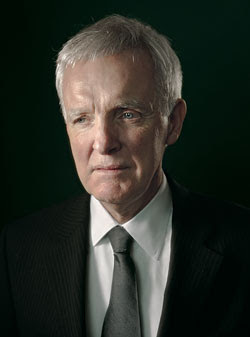 Bob Kerrey also wrote editorials advocating war in Iraq, in the glory days before it was 100% certain that we would get involved in that massive fucktastrophe for no actual reason, and in those editorials he made sure to mention the fact that he was President of the historically liberal, not to say radical, institution which I attended, thereby dramatically misrepresenting its stance and potentially broadening its appeal to the sector of students who also happen to be total assholes. ("Rebranding" and "broader appeal" are big things for Bob! Even when they compromise the values and/or quality of education provided by the school! "Less learning, more branding," that's Bob's motto! Also: "there's nothing you can learn in our small, politically progressive liberal arts and graduate schools that you couldn't fail to learn in the huge, large-classed, apolitical, completely anonymous and undistinctive schools I will build once I raze yours to the ground and also the professors have all starved to death because I barely pay them," which is kind of a clunky motto, but whatever.) Bob Kerrey invited John McCain to speak at a graduation ceremony for that school, with little to no student support but much personal feeling of bro-ship backing that (protested, again) decision. Bob Kerrey has shown a continual drive to re-make the school in his own image, as a successful business with Bob Kerrey's politics, rather than a school with a rich legacy of folks who are substantially to the left of Kerrey, without taking on sufficient feedback or showing sufficient respect to its faculty, and Bob Kerrey has been receiving requests, nay, demands for his resignation, since at least 2002 or early 2003, since the "war on Iraq: yay!" editorials, and Bob Kerrey's response to protest from students and faculty was to shut off all access to his office and/or dialogue, because, seriously, he's Bob Kerrey, he doesn't need this from you people. Also, I saw him in the elevator once, and he has cold, dead eyes and a face like Skeletor. Lighting is not Bob's friend, I tell you. Here, in the 2003 iteration of the "New York feels bad for Bob" article, noted annoying person Howard Dean sits in his office while a rag-tag group of students - featuring a familiar face! - demands some actual accountability. Like, say, talking to them, in a situation he does not completely control! By the end of the meeting, it was hard not to sympathize with Kerrey. The gathering had become a de facto faculty-senate session, with people proposing amendments to motions and motions to amendments—just the sort of endless ping-pong that drives him nuts. The room became an accidental signifier of the seventies, a sea of black jackets and Elvis Costello glasses and long hair. For an outsider, it was hard not to look around and think: These are the kinds of people who’ve given Kerrey grief from the moment he came home from Vietnam. ... where Bob Kerrey killed babies, the piece does not add. Hey, I was in that sit-in, too! (I dropped out after that semester, got screwed over on financial aid.) So cool. I just remember entering his office and hearing him hissing angrily under his breath, "fuckers... fuckers!" It's great to see New School students fighting back again. Also: GREAT blog! My friend linked to the Dollhouse piece today and I've frittered away half the work day reading the archives. You rock.